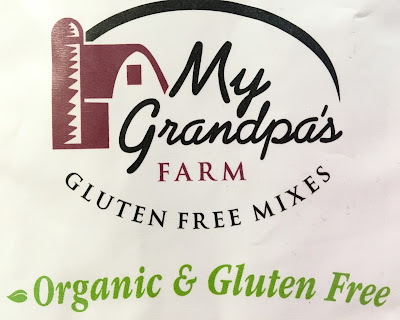 What's really cool about My Grandpa's Farm's mixes is that they are all certified organic. 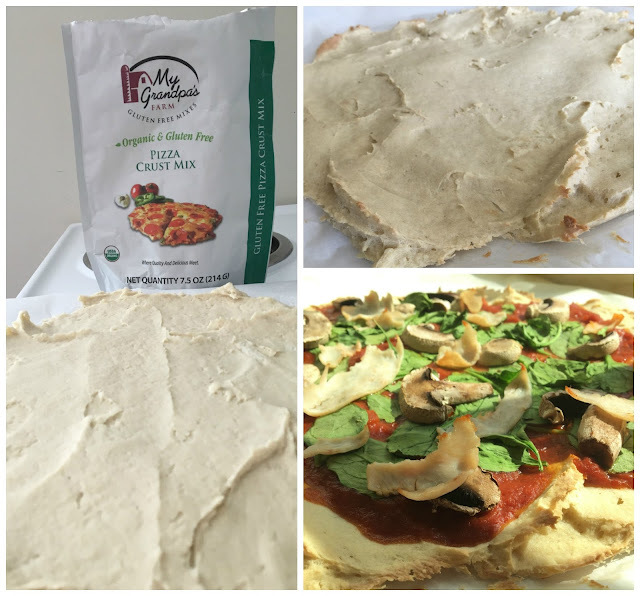 Made without preservatives or additives, the only ingredients that go in are the real deal. When it comes to gluten-free, all mixes are tested to 10ppm and are free from lactose, corn and soy. To bake up each mix, real ingredients are called for as well, including real bananas, pumpkin, olive oil, and eggs. As I mixed up the banana bread, I made sure to wait until my bananas were at the peak of ripeness so that they were especially sweet. Adding to it earth balance soy free butter and eggs, the mix was super simple to throw together. During baking, the exterior turned really dark, which prompted me to pull the bread out close to it's cooking time, which proved to be a disastrous mistake because the bread sunk into itself due to under-baking. I don't know if I used too much banana, or the bread just needed to be in a little too long, but I was disappointed that I had to toss most of the loaf. The bits I did try that were fully cooked were delicious, banana-y and bready without being too sweet, and I loved the caramelized flavor of the crust. Where it wasn't soggy, the bread was nicely textured and quite large, which would have rendered at least a dozen thick slices. The pizza crust mix comes together with egg, oil (I used olive), and water. Each bag makes a 12" pizza, and with some smoothing out, I was able to pull off a 12" crust, however imperfect it looks. After forming the crust, a quick parbaking is needed before topping, which allows the crust to begin to harden up. I topped mine with marinara, spinach, mushrooms, and deli turkey, then placed it in the oven for the final baking. When it emerged, I liked how the bottom of the crust was beginning to crisp up and the edge had a crunch to it. Because of how big the pizza was, the crust wasn't able to support the weight of the toppings too well so it made eating the pizza a slightly messy affair. The crust was nice and chewy, as pizza crusts should be, and I have to say I really liked it. Despite the many crust mixes I've tried, this one scores in taste, performance, and ease of use. The final of the three mixes I was sent to sample was the pumpkin spice cake mix. This mix needs only pumpkin, egg, water, and oil (I used canola). Although I'm sure the mix would work well to make cupcakes or a loaf, I stuck to the package's directions, which called for baking in a 9 x 13 inch cake pan. 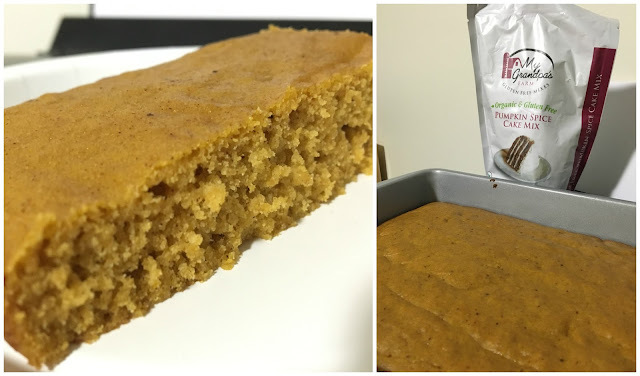 The resulting cake is thin, but really moist and has a perfect balance of pumpkin flavoring and spices. I definitely would add vanilla frosting on top for some extra sweetness, or would mix-in pecans for some texture variation. It froze beautifully and I have really enjoyed taking out slices one at a time to defrost overnight for a quick grab-and-go breakfast during my early classes. Overall, I liked the three mixes I tried. 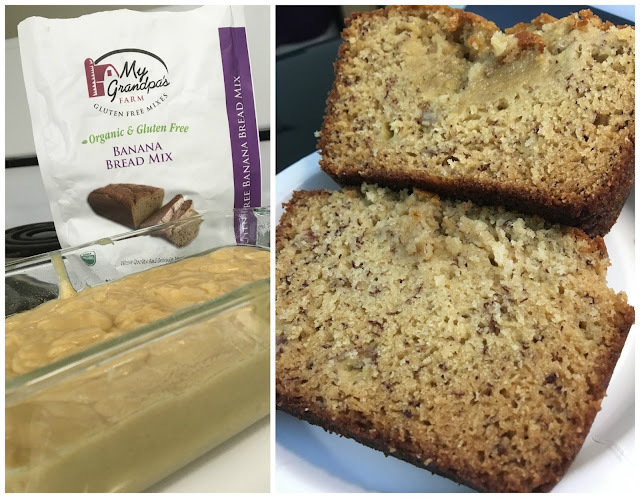 Except for a slight baking error with the banana bread, the mixes were easy to make and did not require extensive steps to prepare or unusual ingredients, which I really appreciated as a busy college student. They make clean, organic eating easy, and delicious. 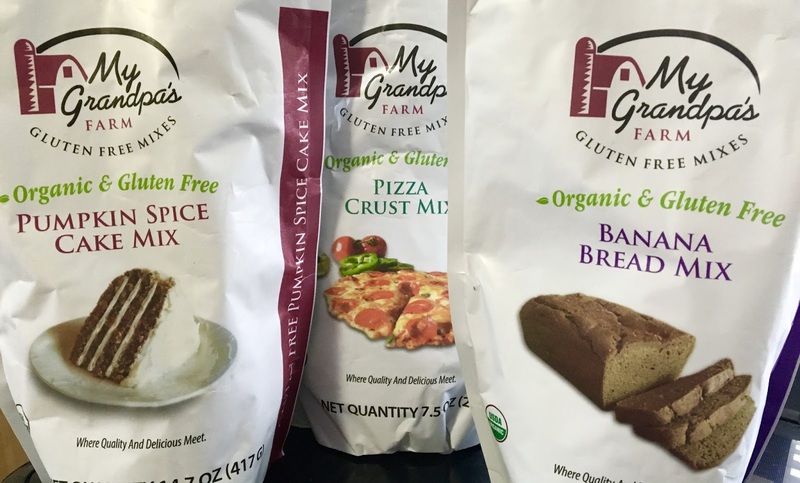 I definitely want to try more of My Grandpa's Farms mixes, especially the peanut butter cake mix. For more details about My Grandpa's Farm including their full line of mix offerings, click here. The mixes can be ordered on their website as well as through Amazon. But wait, there's more! I have an extra pouch of each of the mixes I reviewed on hand to giveaway to one lucky reader! Disclaimer: This review is current to the original publication date. Updates will be noted. Ingredients and manufacturing processes can change without notice. Each product should be reviewed for individual nutritional needs. Feel free to to contact me with any questions or comments. My Grandpa's Farm sent me samples free of charge for review purposes, but the review is a reflection of my personal opinion. I would love to try the Pumpkin Spice Cake Mix. I buy their pumpkin spice cake mix weekly at my local natural food store. It is AMAZING and the loaf never caves in the middle. My non-gf kids even eat it up. As of Jan 2017 Amazon and MGF website show 'out of stock'. Please support this talented company.